This week Social Media Club President Kristie Wells and I are here in Paris to cover Le Web 2009 and support the growth of Social Media Club in Europe. If you aren't yet familiar, Le Web is the premiere conference for Web entrepreneurs and innovators in France. Loic and Geraldine LeMeur have done a fantastic job putting together an event that transcends national boundaries, bringing in some 2.000 people from all across Europe and all around the world. We are fortunate to be here for the full week, exploring the true Paris, interviewing European startup and re-connecting with old friends. We will also be hanging out with Social Media Club members like Pierre Yves Platini, Erho Hannink, Nicole Simon and many many more talking about how we can better connect local chapters all over the world. I started thinking about coming to Le Web as soon as I arrived at the conference last December. There are so many stimulating conversations. There are so many people you can't meet anywhere else all in one place. And best of all, its in one of the greatest cities in the world. But I didn't want to just attend, I wanted to do something special. So when I started talking about Le Web with Dana Oshiro from Read/Write Web back in October, I said "we should host a Social Media Club House during Le Web". Of course, her reply was the same as you are thinking now. What the heck is that? Social Media Club House is a way that we can bring members, media makers and friends closer together in a sort of "Real World/MTV" meets Social Media sort of a way. Only this time, its all about getting along and making media instead of hooking up and fighting each other (though there is perhaps on some occasions an equivalent amount of drinking :). After having lived in a fraternity house in college and a group house on South Beach (Miami) with a business partner and a bunch of fashion models, I personally love the idea of communal living. Even more so when you look at the mix of people we have in the house. 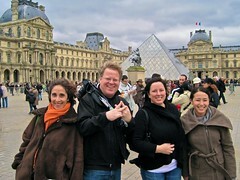 Yesterday, the Americans arrives with Robert Scoble, Cathy Brooks and Dana Oshiro joining myself and Kristie. On Tuesday, the unstoppable Stephanie Booth arrives. Of course, we couldn't do something this cool all on our own. We are fortunate to have PayPal and PayPal X as our patrons and sponsors (or perhaps you prefer the word underwriters). Without their support, this would have just been another unfunded great idea. Given the nature of this conference, we wanted to do something special. We wanted to cover the conference and the city in a way we haven't been able to do yet. This week is your chance to peak behind the curtain, to join a bunch of bloggers and to participate in a way you have never been able to do before. So join us, be a part of our Social Media Club House and help us make the most of this great opportunity together.